We have launched our new website thats bigger and better than ever. Please visit us at http://www.cheesecakedelivered.com/ to see our new and exciting products. MEXICO CITY — Mexico has long been known for tacos and tequila – but cheesecake? 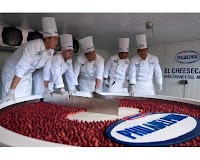 Chef Miguel Angel Quezada says 55 cooks spent 60 hours making the world's biggest cheesecake – a 2-ton calorie bomb topped with strawberries. The monster cake used nearly a ton of cream cheese, the same amount of yogurt, 350 kilograms (772 pounds) of pastry, 250 kilograms (551 pounds) of sugar and 150 kilograms (331 pounds) of butter. Carlos Martinez of Guinness World Records declared the cheesecake the world's largest on Sunday at an event sponsored by Kraft Foods, maker of Philadelphia cream cheese. There wasn't much competition. Guinness had no previous record for cheesecakes. Organizers gave out 20,000 slices around Mexico City. Over the years, I have tried searching for something "just-right" for my individual employees. I try to get to know them, learn about their hobbies and their families. But, I'm sure that "World's Greatest Golfer" statue that I got for Bob five years ago is either in a box or in the landfill by now. Eventually, I turned to food. I started out with fruit baskets, but those get pretty boring. I found personalized baskets with coffee or soup and mugs or bowls. Those are pretty cute. But, once I started giving cheesecakes, everyone seemed a lot happier. In fact, now they would be disappointed if I started looking for other employee gift ideas. They sort of "expect" their cheesecakes. In the beginning, I was surprised to learn about all the different luscious varieties that are available from the better companies. I thought you might find them interesting. These are particularly popular around the holidays. They've pretty much taken the place of pumpkin pies, in my mind. You get that same kind of flavor in a light airy dessert that literally melts in your mouth. Not a fan of pumpkin? How about mangos, pecans, blueberries, chocolate or caramel? The best bakeries offer a large number of choices. "Happy Birthday, Bob!" "Happy Anniversary, Judith!" Anything that you can say on an ordinary cake can be said more scrumptiously with a cheesecake. These are great employee gift ideas and you can always include an E-card or greeting to make it even more personal. When I have new employees, I tend to stick with the samplers. That way, I can be sure that at least "one" of the choices will be appealing. Then, I try to make a note of remarks that they make about specific flavors. If he didn't like the raspberry swirl, I'll order something different next time. The first time that I ordered a cake, I got it from a bakery in town. I had to go there one day to place the order. I had to stop in again to pick it up. It was good, but I have found that ordering on-line simplifies the process. Cheesecake Delivered.Com, for example, has a variety of cakes and other employee gift ideas. I have one employee that only eats "organic" food. Believe it or not, they make an organic cheesecake! Having it delivered is just the easiest and simplest option, but local bakeries charge a fortune and you can never count on a delivery date or time. There's nothing more frustrating than having the party delayed, because the dessert hasn't arrived. The tarts and truffles from Cheesecake Delivered are delicious, too. We have never been disappointed with their employee gift ideas and I think that's the most important thing. Give it a try and see what you "your" employees think. Giving a Cheesecake as A gift? Each year, millions of Americans must buy gifts for specials occasions, which may include birthdays, anniversaries, weddings, and popular holidays. In fact, a number of Americans also give gifts to those that they love just because. If you are in the market for a gift for a special occasion or even for no reason at all, you are urged to examine cheesecakes. When it comes to cheesecakes, they are often most commonly associated with desserts, not gifts. While you may not, personally, associate cheesecakes with birthday gifts, wedding presents, and such, cheesecakes as gifts are rapidly increasing in popularity. In fact, a large number of individuals are now giving cheesecakes as gifts, instead of traditional gift baskets. One of the many reasons for this is because of the formats. If you are relatively unfamiliar with cheesecakes, you may not necessarily know that cheesecakes come in a wide variety of different size, shapes, and styles. Just a few of the many cheesecake types that you can purchase are outlined below. One of the most highly sought after and searched for types of cheesecakes is pumpkin cheesecakes. While a large number of individuals prefer giving pumpkin cheesecakes as gifts around the holidays, pumpkin cheesecakes are ideal for just about any occasion, at anytime of the year. When it comes to pumpkin cheesecakes, you will find that they come in a number of different styles. It is not uncommon to find pumpkin cheesecakes are that referred to as pumpkin spice cheesecakes and pumpkins swirl cheesecakes. Each pumpkin cheesecake style combines the tasty flavor of pumpkin with the always tasty flavor of cheesecake. Aside from pumpkin cheesecakes, chocolate cheesecakes are one of the next types of cheesecakes most commonly sought after. When it comes to chocolate cheesecakes, like pumpkin cheesecakes, you will see that it is possible to find numerous styles of chocolate cheesecakes. For instance, many online cheesecake stores or retailers have chocolate cheesecakes available for sale as chocolate swirl cheesecakes, chocolate caramel cheesecakes, as well as double or triple chocolate cheesecakes. Chocolate cheesecakes are the perfect gifts for dessert lovers, as they combine two of the tastiest items in the world, chocolate and cheesecake. Berry cheesecakes are also ideal for cheesecake gifts, as many individuals, possibly including your intended gift recipient, enjoy strawberries or raspberries. When it comes to strawberry cheesecakes and raspberry cheesecakes, these cheesecakes are most commonly available in swirl styles, as with most other cheesecakes. For instance, a strawberry swirl cheesecake will have swirls of tasty strawberry juices throughout the entire cheesecake, as it is the same with raspberry cheesecakes. When it comes to giving cheesecakes as gifts, strawberry cheesecakes and raspberry cheesecakes are often considered the safest choices. As it was previously mentioned, many individuals enjoy the taste of strawberries and raspberries. With so many great cheesecake flavors and varieties to choose from, you may be unable to pick just one. If that is the case, do not worry, as you are not alone. In fact, that is why a large number of cheesecake makers and sellers have started offering cheesecake samplers for sale. Cheesecake samplers are a collection of different cheesecake styles. For instance, if you were looking to purchase a chocolate cheesecake as a gift for someone that you know, but if you were unsure as to what chocolate cheesecake you would like to purchase, you could purchase a chocolate cheesecake sampler. Depending on the sampler packages available, you could have a few slices of triple chocolate cheesecake, chocolate swirl cheesecake, chocolate caramel cheesecake, and so on. If sending a cheesecake as a gift to a friend or relative sounds interesting to you, you will need to find a company to do business with. For the utmost convenience, you are urged to examine shopping online. A number of cheesecake companies, including CheesecakeDelivered.com , will ship your cheesecake gift right to your recipient, frozen. CheesecakeDelivered.com will also allow you to send a personalized greeting card with your cheesecake gift, no matter what the occasion. See why Cheesecakes make the perfect gift!